It’s never easy to hold your tongue when you’re being insulted. It’s even harder when it’s a hot, humid, bad China day and you’re being insulted unfairly because of your curtains. How do you find the grace to be a “good idiot” in situations like that? 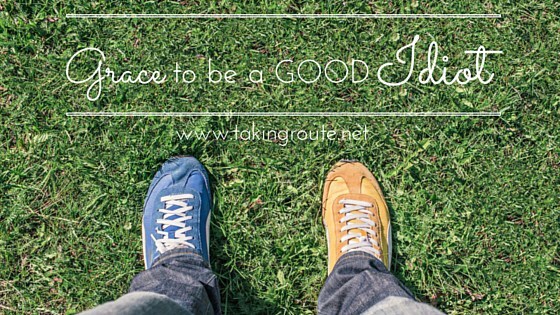 Read my story at Taking Route here: The Grace to be a Good Idiot. Enjoy! Thank you for reminding me that it’s okay to be an idiot. I hate it when I run in to the occasional person who couldn’t be bothered to try to understand what I’m trying to say, or more embarrassing, when they don’t understand my poor tones and finally get it and repeat it properly and laugh at me. It’s not very common but it hurts my pride terribly. I’ll try to remember this post the next time the lady at the property company laughs when o say my hot water machine is leaking, and try not to feel so mortified! I hope it helps to know you’re not alone! There are plenty of us fumbling along and getting laughed at. Thankfully, in my experience, most people who laugh at my Chinese mistakes really are not trying to be malicious. Whatever I did say was simply funny!